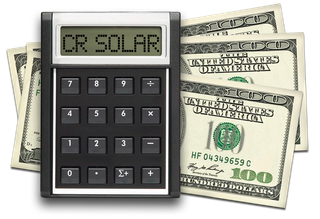 Use this calculator to see how CR Solar can help you save big on your electricity costs. If you currently have investment income, you should consider our Investment Income vs. Solar Energy Savings calculator. The average rate you pay for your grid electricity today. 33.0 cents per kWHr is typical as of Summer 2014. Use the slider below to set this value to the rate you pay for grid electricity. Don't forget to include sales tax and other taxes as appropriate for your circumstance.